Catherine says "The gentleman first on the left of the middle row is Robert Urquhart, local butcher." 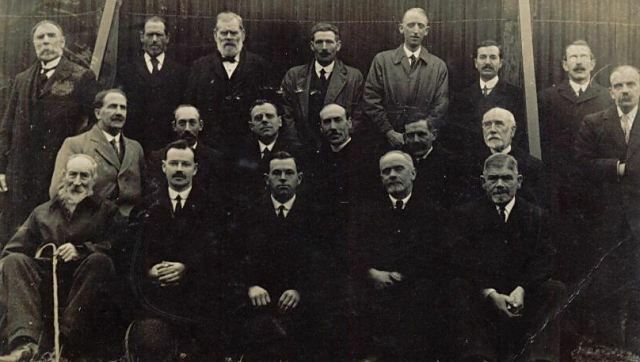 Middle Row on the right with beard and moustache looks like my Great Grandfather, James Reid. He was a Fish Merchant and lived in Gordons Lane. The house was lost in the flood in 1940, some while before I was born. Apparently he was a devout Teetotal Churchman as well as a Freemason. Sadly none of his Great Grandchildren have followed his example! I think I can see Ex Prov Bain, Frankie Middleton (Rosefarm), Mr Malcolm (Headmaster), Robert Urquhart (Butcher), Prudend (Banker), Minister MacRitchie, Jimmy Reid, Roderick Matheson. I think the gentleman front row, far right might be Robert Watson. Most interested in contacting either Robert or Margaret Urquhart or their descendents. Trying to locate information re James Urquhart who emigrated to or was forced into military duty to serve in the New World in the mid 1700's. Hi I am very interested in Hossack family of Chalkhill and Davidston, I have family album with photos of Hugh Hossack in army uniform, James & Grace Hossack wedding, Willie Hossack in Navy uniform, Hugh Hossacks parents and grandaparents. there are also many images of people in New Zealand and Australia. My great grandfather (1861-1935)and second great grandfather (1825-1860)are both named Hugh Hossack. My great grandfather came to the USA in 1905 but I am certain I would still have some family in the area. I would love to see photos and share any information if anyone has any available and you feel we may be related. I have a few photos taken by a photographer in Wick but no identifying information such as dates or who they are. I am so happy to have found this great website.